It really IS a constant battle against scammers. Let’s begin with the Bio Disc. This is a ridiculous mass produced lump of glass that the manufacturers, and more importantly the distributors, claim has some truly miraculous properties. Of course this is all complete nonsense. Ignore all the crap (yes, that’s a scientific term) about positive energy, scalar energy frequencies and reversing the effects of smoking. One of the commonest arguments we get any time we criticise a piece of pseudoscience like the Bio Disc is that we are just pawns of the huge pharmaceutical and medical industry. If you believe the “alternative medicine” loons the big capitalists see these alternative wonders as threats to their profits that must be suppressed. But think about it. If these ghastly capitalist companies were so profit-obsessed wouldn’t they grab the chance to make money from a silly worthless blob like the Bio Disc? If this thing even worked a little then big American pharmaceutical companies would be in there like hyenas. Let me make this perfectly clear. 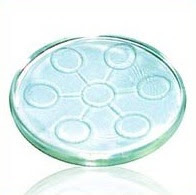 The Bio Disc is a lump of glass, no more than that. Actually let me correct myself. It IS more than just a piece of Chinese glass. It’s a pyramid scheme. The guys here selling this ludicrous scam are recruiting people into a pyramid scheme called Questnet. We’ve heard from several people who have been attracted to the presentations these people have delivered either at University of Botswana or Falcon Crest, we’ve heard how they’ve presented the miraculous benefits of this piece of utter crap and we’ve heard how they ask their victims to cough up thousands of Pula to buy the damn thing. We’ve also heard how they offer boundless wealth and prosperity if you join their ridiculous pyramid scheme. Please don’t waste your money on this nonsense. It’s a scam, it’s a pyramid scheme and it’s a lump of glass. No more than that. 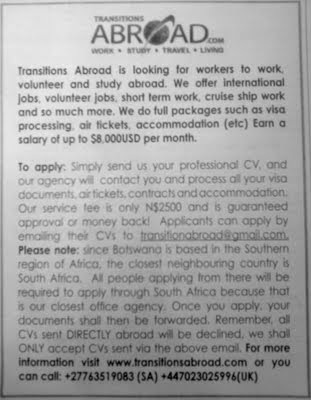 Then there is the Transition Abroad scam. Transitions Abroad (note the extra S) is a legitimate web site that offers advice and stories on working away from your native land. However their name is being abused by a bunch of scammers. First some history. In March this year we exposed scammers calling themselves “ITA Work and Travel” who were offering enormous salaries to totally unqualified people in far-flung parts of the world. Most of the victims were offered jobs on cruise ships with vastly extravagant wages, opportunities to visit exotic places and sometimes even a “diplomatic passport”. Of course this was all a scam. The key piece of evidence was that you had to pay $350 up front. The second clue was that they claimed you had to get a US visa from the US Embassy in Pretoria, not from the embassy in Gaborone. When we saw one of these visas that had been emailed to the victim by the crooks we could see instantly that it had been created on a computer. We also sent it over to the US Embassy here in Gaborone who also confirmed that it was a fake. More recently we saw advertisements from a company calling itself Transition Abroad. This involved the same up-front payment, the same unbelievable offer of employment, the same inconsistencies. Then we noticed something important. The South African and British phone numbers they gave in the advertisement were exactly the same as the cellphone number used by the ITA crooks in March. It’s the same bunch of hoodlums as last time. Last time, when they were ITA Work and Travel, they got away with more than P10,000 from some people. Let’s make sure that this time they don’t get away with anything. If you’ve seen the advertisement, don’t contact them. If you’ve already contacted them then make sure you don’t give them any money. If by any chance you’ve already handed over your cash, then, well, err…. sorry, it’s too late. · Parnell from FNB for brilliant telephone skills.